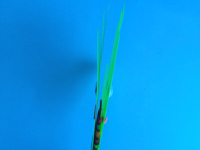 It's a puppet, it's a party accessory, it's...fun! 1. Gather your material. 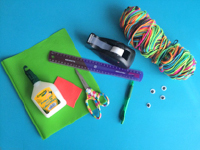 You will need multicoloured yarn, adhesive tape, white glue and/or hot glue, scissors, a flexible ruler, a crayon, four wiggly eyes, a piece of red Fun Foam, and a plastic file folder or duo-tang. 2. 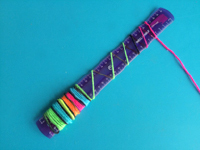 Use the adhesive tape to secure one end of the yarn under the ruler as shown. 3. 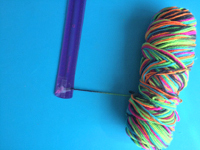 Wrap the yarn around the ruler, sliding it towards the bottom. 4. 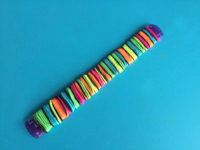 Continue until the ruler is completely wrapped in yarn. 5. Trace the child's hand (or your own if you wish to create a larger puppet or model) on the cover of the plastic file folder or duo-tang. 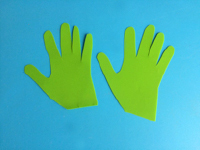 Cut the hand shape out of both plastic layers. 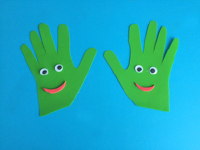 Count the fingers on each hand with the child to introduce him/her to counting. 6. Position the hands on the table so that both thumbs are next to each other. Glue two wiggly eyes on each hand. Cut two mouth shapes out of the red Fun Foam and glue one on each hand as shown. 7. Glue the hands on either side of the ruler, with the eyes towards the exterior. 8. 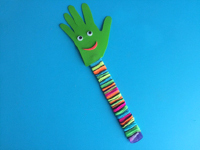 Show children how they can shake the ruler to bang the hands together and create a clapping sound. Use the clapper to highlight children's accomplishments and good behaviour throughout the day.